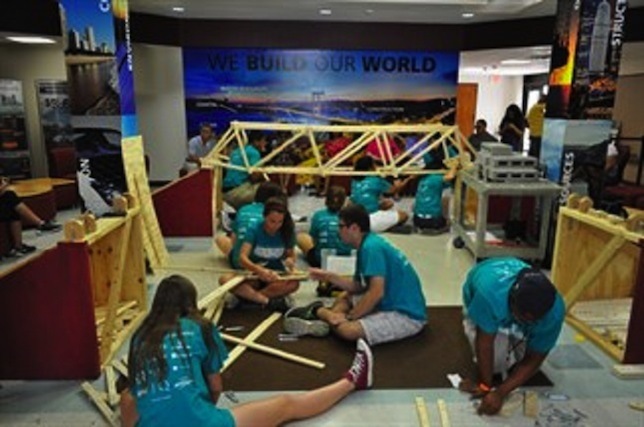 Texas A&M University's civil engineering department has wrapped up the second annual CampBUILD, a project-based summer camp that brings high school students to campus for a week of finding real-life solutions to challenges involving science, technology, engineering and math (STEM). "Project-based learning is a highly effective approach," said Texas A&M Civil Engineering Department Head Robin Autenrieth. "Added benefits are the things we can't teach them, like the value of collaboration, critical thinking and confidence." The 75 students accepted for the program came from all over Texas, as well as schools in California, Colorado, Illinois and Ohio. Although records for academic achievement were important, so was the fact that many of them did not have access to engineering courses. "We need a civil engineering professional that has experienced and appreciates this richness," said Associate Professor Kelly Brumbelow, "and we selected a group of campers that spans these ranges." Throughout the week, the students participated in a number of hands-on experiments, tours and competitions. Among other things, they saw clean water drip from a filter they had built themselves, a truck smash into a guard rail during a crash test, and the intricacies of building a stadium that will safely seat 100,000 football fans. "I really recommend you come to CampBUILD," said Sachse High School Junior Makysia Goodwin of Sachse, TX. "You meet people you never thought you'd be friends with, and you learn so much beyond engineering." The additional good news for Texas A&M is that high school students like Goodwin may end up on its campus one day. Of the 20 high school seniors who attended last year's inaugural CampBUILD, 13 will enter Texas A&M this fall as freshmen, 11 as engineering majors.